A force gauge is a compact measuring instrument that is used in a variety of different industry settings, including but not limited to laboratory, research and development, production and field environments. Two different types of force gauges are available: digital force gauges and mechanical force gauges. 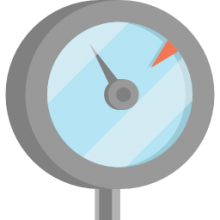 Digital force gauges are rapidly replacing analog, though both are still widely used. Let's take a look at some of the best-selling force gauges on the market. Measuring up to 500N with a value error of only 0.5%, the HF-500 digital force gauge presents you with accurate real-time results on its backlight LCD display. It supports 3 measuring units including N, Kgf, and LBf which makes this force gauge user-friendly for international applications. Most users were impressed by the HF-500 Digital force gauge, impressed by its affordability overall quality. However, there were some complaints, with one buyer we spoke with saying that it’s pretty accurate when using the pulling method, but less so when pushing. A compact and rugged aluminum housing ensures the durability of this force gauge and its compact design make this force gauge fit perfectly into the hand for ease of use. 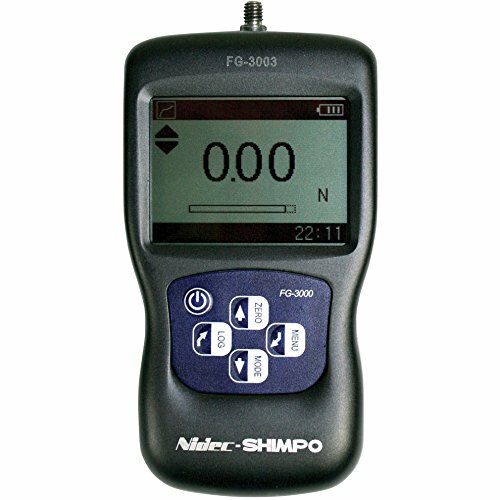 The Shimpo FG-3008 features 3 operational modes: Track mode which displays live readings, Peak mode records the maximum reading during a test and a Pre-set mode which activates user-defined high and low set points. 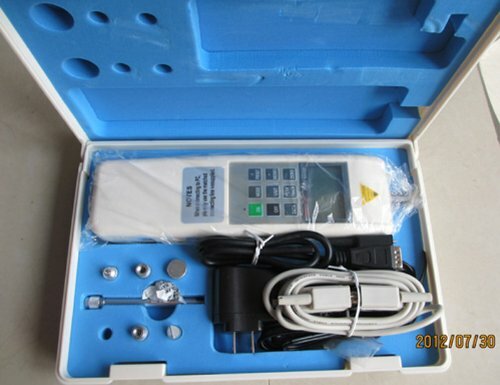 It has a large backlit LCD display and can be connected to PC via USB for data logging, graphing and statistical analysis making this digital force gauge ideal for various applications such as finished goods testing, R&D, force stand testing etc. The NK-300 analog force gauge is a really compact, highly accurate gauge that can be installed on all testing tables. 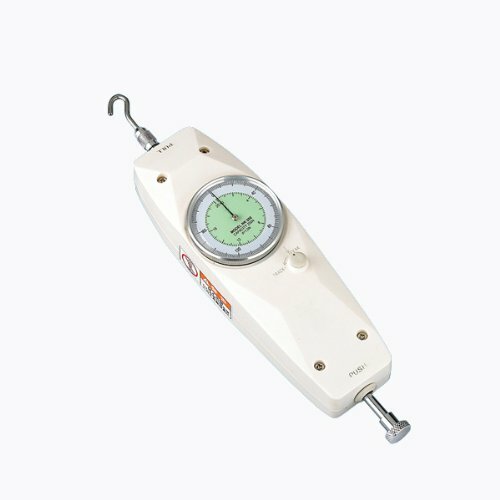 This force gauge has a minimum load of 30N (3kg), maximum load of 300N (30kg), accuracy of +/-1% and a pointer style design, which makes it extremely easy to use and perfect for both home and semi-professional usage. Reliable quality and quality casing are a guarantee of high durability, which make the force gauge long-lasting and easy to maintain. If you’re searching for a cheap analog force gauge with free shipping included, NK-300 might be the one you are looking for. Featuring a push/pull measuring system with +/-4% accuracy, 5 digit LCD display, the Extech digital force gauge is ideal for a wide variety of applications including chemical, automotive, machinery, plastics and electronics. This force gauge is available with or without a NIST certification, which guarantees quality and precision but costs an additional $165. The Extech’s force gauge is shipped in a package with six AA batteries, hook adapter for tension, 5” extension rod, 3 compression adapters and comes with a 1 year guarantee. If you don’t mind spending a little bit more money for a quality product that will last through years, then Extech’s digital force gauge is the product for you. The DS2-110 digital force gauge by Imada is a precision instrument featuring a large easy-to-read 4 digit LCD display and a simple push button operation. A solid metal housing protects the electronics and load cell in tough industrial environments. It has received some solid feedback from its user base we spoke with, which is pretty assuring. One of the customers even bought additional unit after years of good experience with the first one and highly recommends this force gauge. Although DS2-110 comes with a high price tag, its quality is unquestionable. Two year warranty and free shipping are included with this product. 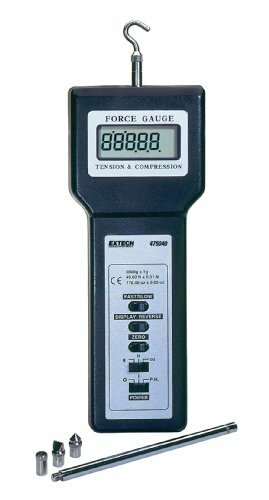 Handheld force gauges are convenient for quick testing purposes, either tension or compression. These are highly sensitive instruments that promise extreme levels of accuracy. 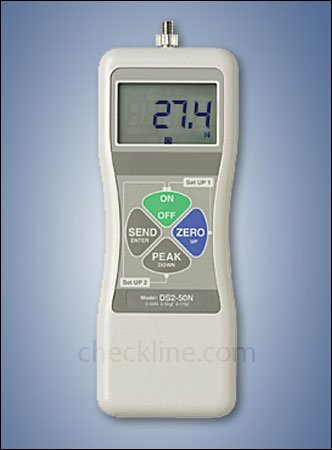 With the digital gauges you are often able to connect the device to a computer and store readings for more detailed later analysis. In the case of the digital force gauges, a load cell is what converts force into an electrical signal. With analog gauges, a strain gauge provides an analog read out. These are handy tools to have around, but definitely be sure examine the different warrantee options for the device that you are considering prior to purchase. Another important consideration is to examine the support manufacturer offers. Sometimes, given the high sensitivity of these devices, there can be some calibration issues that you may encounter. It’s always important to understand what support resources are available for the device that you are considering should you run into any problems operating the unit.